I had been hinting at - OK, nagging - my boyfriend to take me somewhere nice for my 35th birthday so was pleased when he told me he had booked the Wolseley - I had read only the day before that Samuel L Jackson had been papped eating there. I liked the way the restaurant was laid out, with a circle in the middle and tables on a slightly higher level around the outside of the circle, as it meant there were no dark corners and you can have a good view of people coming and going if that sort of thing interests you. The building was former car show room and a bank before it was a restaurant. The inner circle is clearly the place to sit because once again, Samuel L Jackson was there! The restaurant is quite traditional in style, complete with doorman; the staff were very polite and attentive. The menu is also quite traditional; the main courses include kedgeree, grilled halibut, honey-glazed duck, rib eye steak etc. There are some more modern combinations like sea trout with samphire and cucumber and lobster and chips with samphire and garlic butter, but this isn't somewhere you come for cutting-edge fusion food - it's somewhere you come for classic dishes done really well. 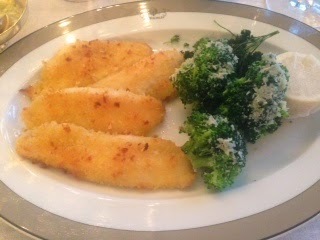 I ordered the lemon sole which was very simply prepared and presented but tasted delicious. 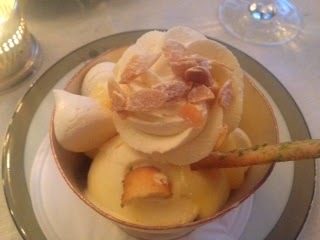 I had a kind of lemon meringue dessert which included ice cream and meringues, which was very refreshing. The food is quite expensive but definitely good quality though now that I've been here I'm not in a rush to go back - it's more one of those restaurants you tick off a bucket list. Still, it's a good location for a celebratory meal.